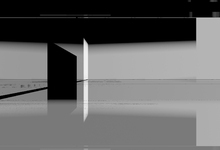 The experimental computer animation "laws of reflection" is a series of currently eight empty spaces in total darkness reflecting light. I was particularly interested in which aesthetic information becomes visible due to the reflection of light calculated by the algorithms of the software. The space was rather drawn than constructed, ignoring precision and existing norms. All surfaces vary in thickness, thereby also the openings through which the light can enter the space do. There is no connection to a real space in the sense of functionality statics or other parameters. A static camera was positioned in this room. Outside the space, a light source rotates around the architecture and then returns to its starting point. The light penetrates the room through openings in the architecture and reflects on the surfaces that it meets inside. This reflecting of the light makes the space visible. Because the light outside is in motion, the space becomes not only visible but also animated; constructed and deconstructed. Controlled by the "laws of reflection", this space reveals itself in all its features and movements in correlation to the software. I asked seven composers to write a composition for a specific animation. My interest was their different accesses and methods. Every composer could act freely.